Kilkenny Christian Centre have purchased former grain store sheds (more recently retail and office spaces) at the corner of Dean Street and Coach Road at the edge of Kilkenny City, with around 6,400 square feet of space. The location is within walking distance of the town centre, making it suitable for access for young people with no transport of their own. The site is also adjacent to a car park, several businesses, and the new inner ring road; also at the top of the short road is St Canice’s Cathedral, making the premises a busy business and tourism corner. The most immediate task is to engage specialists to remove the old asbestos roof, and to replace it, and we are currently discussing materials with planners, budgets with contractors, and fundraising. Ground floor development is planned to consist of retail units to be run commercially or semi-commercially. Rented units to include a café and Christian Bookshop (run by a separate interdenominational committee), both of which would share the overall ethos and contribute to the objectives of the centre. 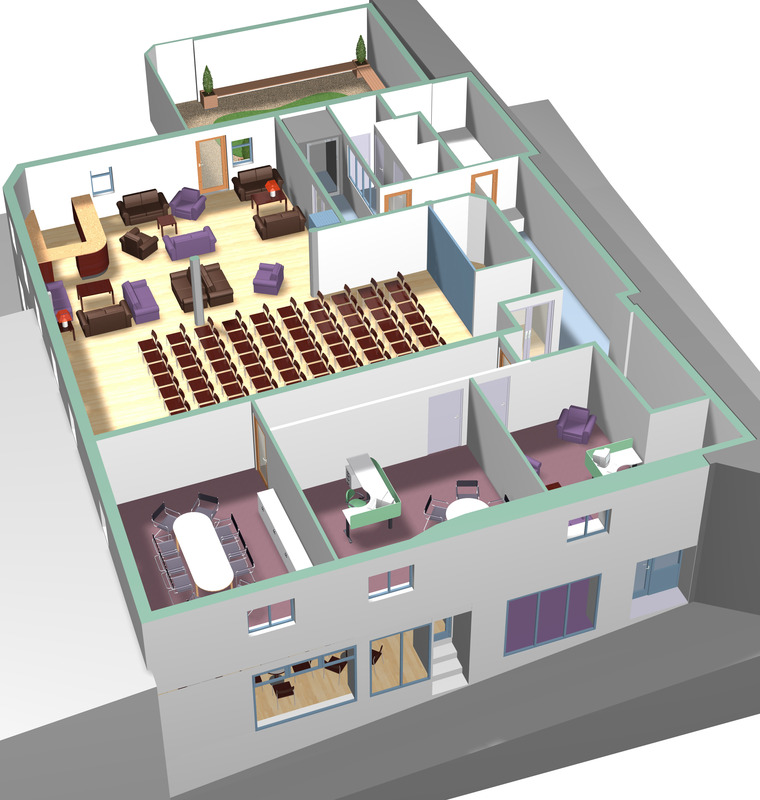 The first floor is to be completely renovated and to house meeting rooms and staff office, and space for “The Rock” youth drop-in, where teens can hang out in a safe environment, play games, watch films, and build relationships with youth workers. We will offer Bible studies and opportunities to explore the meaning of life and the message of the Gospel. The larger meeting spaces will be multipurpose and activities may include music and spoken word events, films, classes (e.g. ESL), and smaller rooms may be used for prayer and counselling. 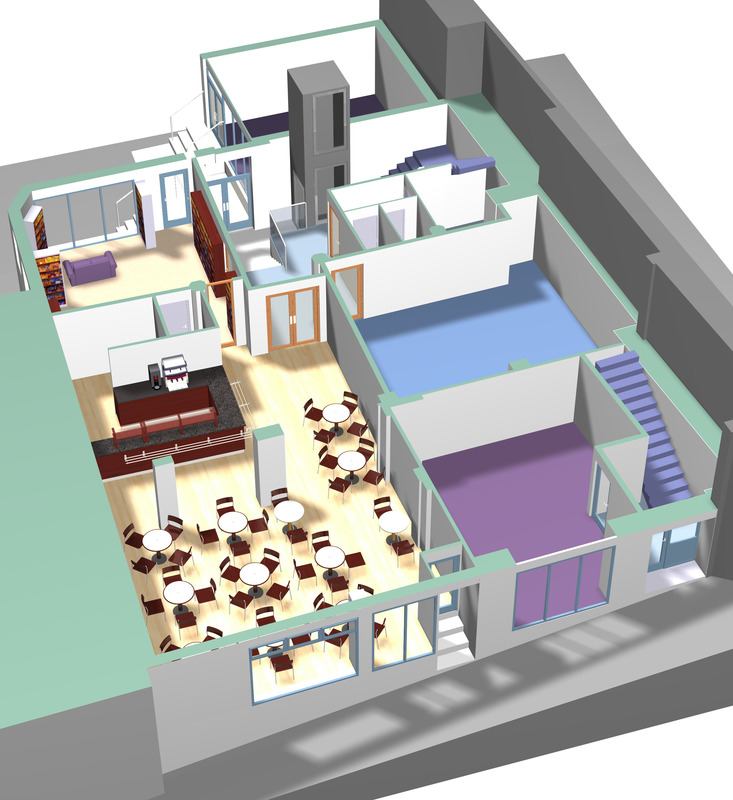 The building will be a resource for churches and fellowships to use for outreach and other initiatives, but also to the wider community, once the use in compatible with the Bible-centred ethos of the Centre. We have been wonderfully supported by local people, largely the Christian community, with gifts and interest free loans enabling us to get as far as we have. We have been applying for grants where these won’t restrict our plans, and there are also opportunities for further loans from community finance groups. However, to pay back all the loans and complete the work we estimate we need to raise a further €500,000. If you think you may be able to help with this (large or small), we would be delighted to hear from you. Feel free to contact us or indeed to use the donate button! We highly value prayer, as we believe none of this will be achieved by purely human effort. If you would like to get our prayer newsletter with updates on the project (only about four a year to date) please send us your e-mail address and we would be glad to add you to our mailing list.